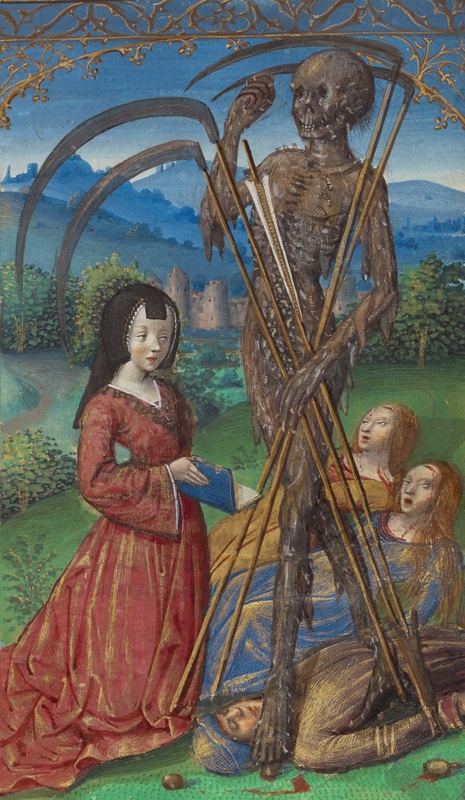 from blogs.getty.edu: Illuminated manuscripts provided the medieval reader-viewer with a rich array of images that often rival those that we encounter on Halloween, from gory scenes of decapitated martyrs or arrow-pierced saints to walking cadavers, creepy spiders, spooky cemeteries, and even witches and ghosts. The images that follow had a variety of functions: some served as moral exemplars, while others instilled fear or terror to inspire pious living, or reminded the living of the fleeting nature of life. Many are full of naturalistic details that heighten the visual experience. Test your artistic acumen: Can you guess which medieval stories and saintly characters these images illustrate, and what they were meant to evoke?